From time to time you will need to save some type of data connected to invoice. Imagine it like a sticker, you write something on it and then stick it to your paper invoice. Now just transfer it to digital world. 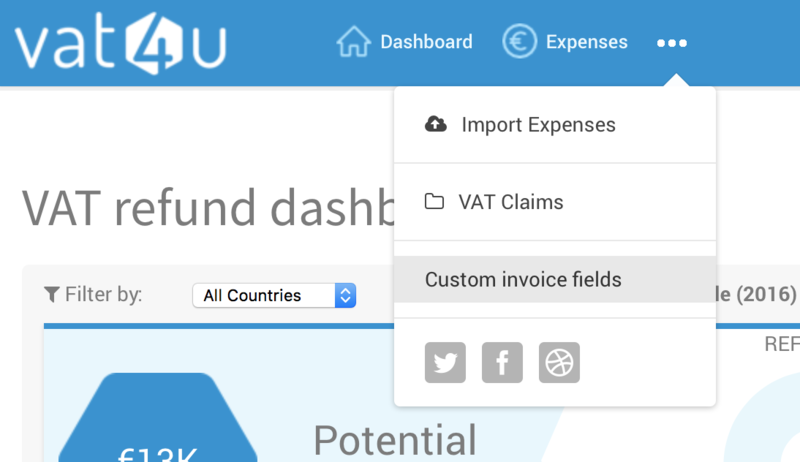 In other words, VAT4U let's you define Custom Fields, which will appear at invoice entry form so you can save some kind of reference to your invoice. Imagine you have your own system reference for each invoice, something like INV#001 and you want to save it inside VAT4U so you can later, in case of need, easily find paper copy of your invoice by just going to VAT4U application and checking for this reference. Here's how to define custom fields, and how to use it. First, you need to have "MANAGER" or "ADMINISTRATOR" privilege for specific company to be able to define custom fields. Step 1. If you operate as AGENT under MANAGING account, first you need to pick Company for which you would like to define new custom field. For regular accounts just skip this step and go to step 2. Step 2. If you have right privilege, in the extended menu, next to "Expenses" you will see item named "Custom invoice fields". Click on it. Step 3. Depending weather you already used this feature, you will see list of existing custom fields or just empty table. Anyway, let's create new field. Click on "Define new custom field" and popup will appear. You need to name your field, pick field type and you can specify default field value (if you want it to be non empty field when users don't enter anything in phase of saving invoice). SHORT TEXT - pick this option if you want to enter any kind of textual data, like "INV#001", "trip to Paris", "Conference for partners" etc.. LIST - use this option if you want to have predefined list of what user can select and inject alongside invoice. In text box which will appear type list, one below other, of all options which should be available. MULTIPLE OPTIONS - same as LIST but user can choose to select one or more options from the list. YES/NO - simple, YES or NO field :) For this field you need to specify default value as it cannot be undefined. It has to be 1 or 0 (Yes or No). To have better overview of field types here's how each looks at the time when you want to use them. Step 4. Finally, where to put custom field values. Simply, on Expense -> Add New, school down to the bottom of the page and you will see all your custom fields grouped in one place, just before save button. Note: Custom fields work per company, meaning, if you operate as an AGENT and you define custom field X for company "TEST X" you will not see this custom field when you inject invoices for company "TEST Z". You need to define custom fields for each company for which you would like to have custom data on invoice. Custom fields can have same names for different companies. If you have any question don't hesitate to chat with our support team. Cheers!